Hollywood Insider Secrets wraps a four part instructional DVD revealing insider makeup tips from top Hollywood makeup artist Christina Rodriguez. (Hollywood, CA) What do A-list movie stars, child actors, and zombies have in common? A fantastic makeup artist. It is the creative vision of those who work behind the camera that bring to life beloved characters adored by audiences. From monsters that terrify to the glamorous actresses viewers try to emulate, it is makeup artists that keep the entertainment industry visually stimulating. And now, the public is going to get a behind the scenes look at some of the techniques used by the top makeup artists in Hollywood. Hollywood Insider Secrets, a lifestyle brand that centers around the entertainment industry and the subculture of glamour and fashion in Los Angeles, has wrapped an instructional series revealing some of the makeup industry's "tricks of the trade". Starring top makeup artist, Christina Rodriguez, the instructional DVDs chronicle aspects of artistry used on film and television sets in Hollywood. "I'm thrilled to be working with Hollywood Insider Secrets" said Christina. "I've really tried to compile tips and techniques for not only new makeup artists but also for people outside of the industry who want to look fabulous for their next event. It's a series I would have benefited from when I was starting out and I'm proud to help others who have a passion for makeup." From commercials to films to haunted houses, Christina Rodriguez has been working in the field for over 15 years. Specializing in monster and horror effects makeup and holding the position of head makeup artist of the infamous haunted house on the historic Queen Mary, Christina brings a multitude of talents to the instructional series, and divulges the makeup secrets that have kept her in high demand in the industry. 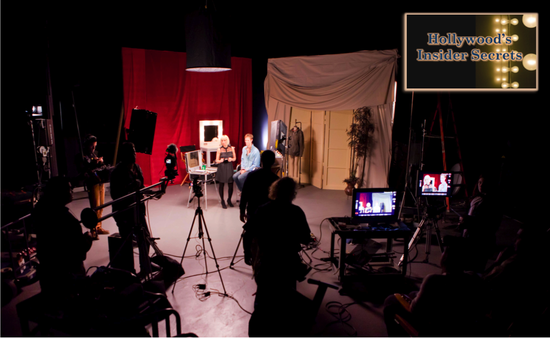 Produced by Ray Ellingsen and Kim Poirier and directed by Bonnie Hallman and Ray Ellingsen, each instructional video is hosted by some of the industry's most seasoned actors followed by step by step instructionals to create a myriad of looks through the art of makeup. 1) Glamour Makeup: Hosted by Kim Poirier (Dawn of the Dead, Mad Men) - Christina Rodriguez walks viewers through a "clean face" look, the most commonly requested look on a film set. She then demonstrates the transformation from a clean face to glamorous Hollywood makeup often found on the red carpet. 2) Special Effects Makeup: Hosted by Michael Berryman (The Hills Have Eyes, Devil's Rejects) - Christina provides insider techniques used in horror films and haunted houses. From zombie looks, to skin decay and gashes, this top FX makeup artist breaks down difficult methods into simple and easy to understand steps. 3) Children's Face Painting: Hosted by Trevor Teichmann (Team Toon) - As a surprisingly popular request for makeup artists, and a wonderful way to ensure income in between films, children's face painting has become an increasingly prevalent art form. Christina gives audiences the basics for fundamental face painting and provides the ideas and tools needed to navigate creative makeup at a children's event. 3) Bonus DVD - Makeup Kits for under $100 - Christina helps aspiring artists create kits for different kinds of makeup jobs without breaking the bank. The four parts series has recently wrapped and distrubuter, TMW Media Group, will be releasing it April. Christina Rodriguez's instructional series is the first of many planned DVDs from the lifestyle brand created to give audiences a behind the scenes view of those who work and play in the entertainment field. "We wanted to design an instructional series that would not only allow people a better understanding of makeup, but also create a template so emerging makeup artists can begin to understand and explore the craft" said executive producer Rolando Vargas. "With the insight of Christina Rodriguez and the high end production value of Hollywood Insider Secrets, we have created a handful of DVDs that we hope will be used for years to come and help solidify the high standards and reputation of the Hollywood Insider brand." Don't miss Hollywood Insider Secrets Makeup Instructional Series staring Christina Rodriguez, coming to the public in April!